The driver can disable the power window switches on the passenger door by pressing the power window lock switch located on the driver’s door to the LOCK position (pressed). 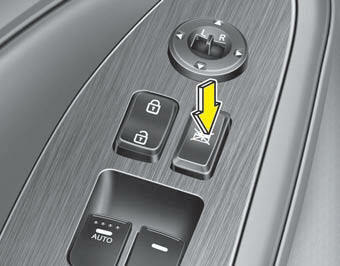 When the power window lock button is in the LOCK position (pressed), the driver’s master control cannot operate the passenger door power windows. Do not allow children to play with the power windows. Keep the driver’s door power window lock switch in the LOCK position (pressed). Serious injury can result from unintentional window operation by the child. Do not extend any head or arms outside the window while driving.